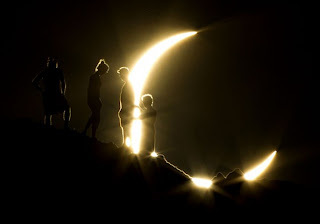 Now we are in the new moon, there is the human and his individuality, his freedom, his will. It 's time where listening to oneself is cleaner than usual but this silence can also create anxiety and dismay with some phobia, so someone is inclined to do too many things! We consider that the solar eclipse empties its planetary symbolism in the event that we can imagine it as the representation of the personality. Also look at the astrological transits: squaring Uranus - Pluto symbolizes the revolution of social and alignment in Taurus brings together the sun, the moon, Mercury and Mars. We are talking about a geocentric alignment that is perceptible from the horizon of the Earth. This is also for the eclipse and then we can say that the interruption planetary also involves these planets that are linked to the symbolism of the communication / intelligence or the physical / impulsivity. What does this mean?